Quick review of Chain Reactors. When I first heard the name "Chain Reactors" I thought it was going to be something awesome like that Boomshine game. Unfortunately, I was (and frankly still am) gravely disappointed. 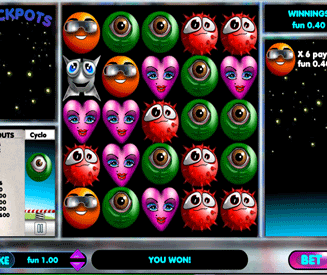 Chain Reactors is more like a mix of a basic version of Cube Crash/Bejeweled and a cheap slot game. However, it’s not one of those epic mixes like; Gin and Tonic or Cheese and Toast. No, it’s much more like the disastrous; Orange Juice and Toothpaste or Running and Scissors. If you want to play a fun game like Cube Crash, play Cube Crash. 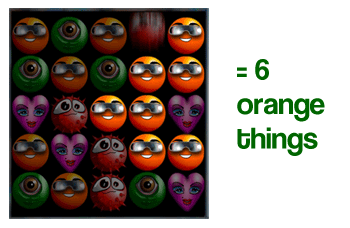 If you want to play a fun slots game, play a fun slots game (or Rubik’s Riches even). If you want to play a game that has absolutely neither of these attributes, Chain Reactors will be right up your alley. Okay, I think I’ll take a breather as I’m sure you’ve got the point. Long story short though, Chain Reactors is a poor man’s Cube Crash with no skill and even less fun (yep). Chain Reactors fun rating - 8%. Chain Reactors is clever in that it’s so morbidly bad across the board, it makes it difficult to pinpoint exactly why it’s no fun. I’ll try not to let it phase me though. It’s desperately slow and uneventful. It’s very one-dimensional. No bonuses, no nothing. Graphics do not compensate for anything. Don’t even get me started on the audio. The vast majority of the fun rating for this game derives from the fact that you could actually win good money if you have the stomach to play it. Aside from that though, it’s incredibly slim-pickings on the entertainment front. If you want to play a good game with limited interactivity, play Rubik’s Riches or Slotblox instead. How to play Chain Reactors. The basics of Chain Reactors. Hope that 5 or more of the "reactor" animal things appear adjacent to one another in the grid. Trust me, it’s even less fun than it sounds. Chain Reactors in more detail. The aim of the Chain Reactors slot is to get 5 or more of the creatures/symbols next to each other. The more "reactors" that are adjacent to each other the bigger the win. The rarer the reactors, the more they are worth. Oh, and by the way, it seems as though Chain Reactors has one more trick up it’s sleeve - there is no easy-to-view paytable. The values of each "reactor" animal is briefly shown in the sidebar as opposed to listing them in one simple chart. No fear! I have far too much time on my hands, so I compiled all of the Chain Reactors creatures/symbols in to one paytable for you. Not that you should ever want or need to use it though of course. 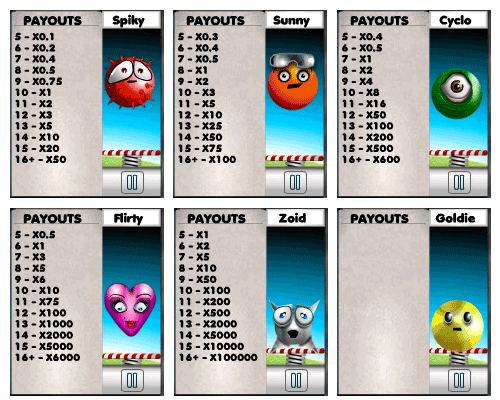 The Goldie symbol is the rarest, and releases current jackpots for the game. 5 Goldies - small jackpot. 6 Goldies - midi jackpot. 7 Goldies - big jackpot. The game I was playing didn’t have a jackpot at the time, which is why the payouts for Goldie show up as blank. The payouts for Goldie will change depending on the jackpot anyway, so it doesn’t really matter.